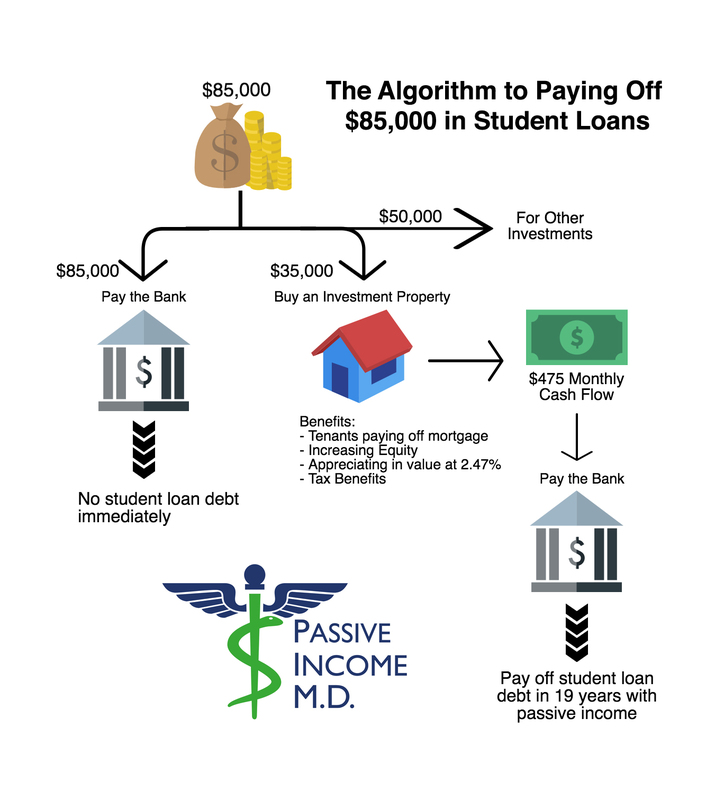 How I Pay My Student Loans Using Passive Income | Passive Income M.D. As physicians, we’ve all felt the crushing weight of the almighty student loan. Some have felt it more than others, perhaps, but a vast majority of medical school graduates wonder if they’ll ever pay their loans off. 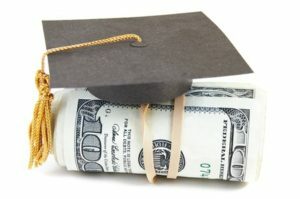 In fact, according to the AAMC, the average medical student leaves school with $183,000 in student loan debt. That can be a very intimidating number. Looking back at my own post-med school debt, I can safely say that I was very fortunate. Why? ● I left medical school with just under $95,000 in student loans that are now less than $85,000. ● I went to my state school where my first-year tuition was only $13,000. Of course, it nearly doubled by the time I finished school, but overall I feel it was quite affordable. After a few years out in the real world, and after buying my house, I found myself in a pretty comfortable situation. I had saved enough money to actually pay my student loans off completely. But did I do that? Nope. See, in my mind, all debt isn’t necessarily all bad. Debt for an education is usually good debt. Taking out a loan for a fancy car and struggling to make payments each month is bad debt. Debt that you can use to make money (cash flow in excess of the interest you’re paying on the debt)… well, that’s very good debt. So, instead of paying off my student loans all at once, I decided to take that money and buy a rental property. In a future post I’ll go deeper into the buying process, but for the purpose of this article, I’ll cut to the chase: I ended up paying a little less than $35,000 to buy a single-family home at a purchase price of $105,000. I rent this property out and receive a cash flow of $475 per month net of expenses. Can you guess what my current loan payment is? $460.46. So as a result, the cash flow from my rental is covering my entire student loan payment every single month. My initial $35,000 is secured to the property as equity, the tenant is paying off the rest of the loan on the home, and I’m gaining further equity in the home. The average appreciation rate in that area is 2.37%, so I’m actually gaining value in the home as we speak. The rest of the 19 years on this loan could be paid off by my tenants, while the property appreciates in value and gains in equity. 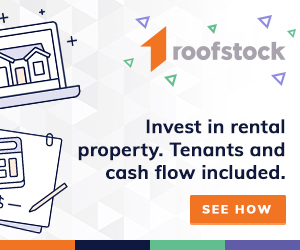 Additionally, when that home is fully paid off, there will likely be a jump in cash flow, and the value of the property should be decently higher. My $85,000 loan will be paid entirely by a $35,000 investment in a home. Eventually, that $35,000 will be worth at the very least $105,000 (the purchase price of the home), plus any appreciation that will have taken place and minus any large repair expenses. What happened to the $50,000 I didn’t use? That went towards a down payment for an apartment building I bought with a partner. With all that said, I certainly can’t fault anyone for choosing to pay off their debt all at once. There is value to the peace of mind that comes from knowing you are debt-free. However, I place a much larger value on building my path to retirement. I’ve thought a lot about whether it’s wise to invest or pay off loans. I can stomach the debt as long as I know it’s being paid off by my tenants. When it comes right down to it, I can rest easy, because my student loans are being paid off completely by passive income. 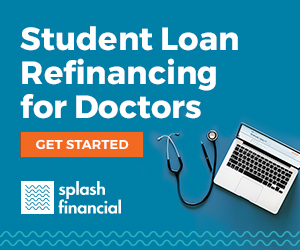 Anyone else come up with other interesting plans to pay off your student loans?